The Other Boufs: Mommy, Daddy, Katie, Timmy ... and more! : I am officially a moron (and a sad one at that). I really thought I had won! 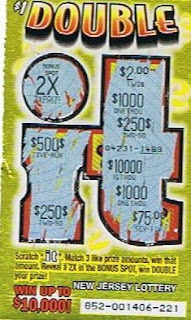 I guess you can add me to the list of old ladies with bad eyesight that get taken advantage of by scratch-off tickets and sweepstakes. Aww man! That's disappointment for ya. Your labels for this post made me laugh out loud. Next time you might win and you'll be thinking "nope, I've done this before..."
Aww too bad. I was rooting for you. Better luck next time! Great 6 words! Hey fellow OCNJ visitor! This post was funny . . I think I would have thought I won too. Thanks for stopping by. Oh, no! I've totally had that happen before. Grrrrrr.